Lookism: Why we don't want to be perceived as "ugly" or "different"
We are living in a visually biased society. Bonnie Berry has written a book about prejudice and racism based on looks. Antropologi.info contributor Tereza Kuldova has read the book. Here is her review. “When we consider the disparity in what we spend our money on, we find the depressing fact that, in the US, more money is spent on beauty than on education or social services. This fact shows the vacuousness of our society, but also may explain why we persist in the mainly pointless behaviors of buying beautifying products and services. If we are not educated, we may believe that physical appearance is more important than being learned, and we may rely on looks to accrue power instead of using our brains” (p.69). The book The Power of Looks deals with one of those topics that impact all of us in our everyday lives every single day, one way or another. Namely our prejudices and conceptions of beauty and attractiveness and the ways in which we act on those and discriminate people based on their looks. Bonnie Berry calls this phenomenon ‘lookism’, which is one of the many ‘isms’ we have to deal with in our world, such as racism, or colorism. The book shows very clearly how the bias towards attractiveness and beauty creates profound social inequalities and determines our access to both social and economic power. It is not news that people who ‘look better’ have better chances to succeed, get jobs, pass oral exams and so forth. In the same way in which beautiful people are positively ‘discriminated’, those not beautiful enough are negatively discriminated. This appearance bias, the beauty ideal created and supported and perpetuated by the media, advertising and cosmetic and pharmaceutical companies, creates a feeling in ourselves, a feeling of ‘not being good enough’, the result is anxiety (p. 57). We tend to constantly fix ourselves, be it through make up, clothes, plastic surgery, liposuction, teeth whitening (and more), in order to be perceived as ‘acceptable’ or ‘normal’, if not beautiful. Being perceived as ‘ugly’ or different often leads to social exclusion, isolation, economic, social and romantic discrimination as well as lack of access to social and economic power. What distinguished The Power of Looks from other popular books on this topic, such as the Beauty Myth by Naomi Wolf or Beauty Junkies by Alex Kuczynski, is that it has a distinctively sociological take on the topic. This is a great advantage over the book Bonnie Berry published earlier, Beauty Bias, which was much more ‘popular’ and part of the same discursive realm as the books mentioned above. 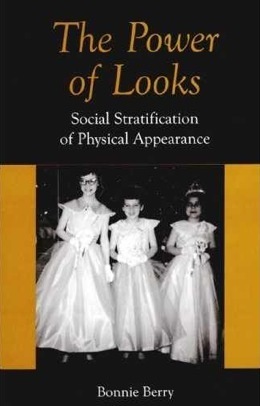 The Power of Looks has even two chapters on theory, method and possible approaches to the problem of social stratification based on our looks and to what she calls ‘social aesthetics’, from functionalism to symbolic interactionism. It is no doubt that this book can serve as a great introduction into the topic for students of sociology and anthropology. The most important aspect of this book in my view is however not its originality or its bravado of writing, but it is its message and the aim to build awareness about social stratification and discrimination based on looks. This is a message of acute importance in our world that is too often driven by media images of what is beauty and what it means to be beautiful, messages that fuel our continual sense of inadequacy and force us to recreate ourselves according to these images through consumption of products that often do very little to improve our looks. In the worst cases, these images, ideals and messages drive us under the scalpel where many have died. (See for instance this ABC news story Mother’s Death Highlights Dangers of Plastic Surgery). The book is important in its focus on and analysis of these phenomena. And since it adopts a sociological approach, it not only builds our awareness about appearance bias and the way it shapes hierarchies and inequality, but it also gives us a conceptual apparatus to grasp these phenomena, to be able to conceptualize them, pinpoint them and talk about them. This is what I consider the greatest contribution of the book. And in line with the message of the book, I wish to draw your attention, in this review, to certain issues that the book raises and that I feel are interesting to think through and reflect about. The role of media and advertising in shaping our tastes, likes and dislikes has been already well documented. The interesting thing is how these commercials try to associate a whole universe of meanings with the products they are trying to sell us. The paramount example is the Indian Fair & Lovely commercial for the most popular Indian skin lightening cream. All of the company’s numerous advertisements follow the same logic which we will see in the example below. These commercials reflect and shape notions of beauty and therefore we should be aware of how they are constructed. Let us look at one of their commercials, as this might ‘flesh out’ the book for its future readers, since it tends to focus little too often on the structural and does not include many concrete examples. Fair skin is in India often associated with higher status. Now watch how this is played out and reconfirmed in the commercial. It begins with a father sitting and reading newspaper, then he asks for a tea with milk. His wife looks back at him with her sad big eyes and says that there is no milk, since there is no money. The father then goes on to complain: ‘I wish I had a son’ – meaning someone who would be able to provide for them. His daughter overhears the comment and starts crying, then the TV in her room features a Fair & Lovely facial cream commercial. At that moment she spots a newspaper job advertisement for an air hostess. She connects the two together (the same way as the audience is supposed to). After applying the cream, she is beautiful and fair, and therefore empowered. She gets the job and the surroundings suddenly turn glamorous, at the end she sits with her parents at what seems to be an airport coffee shop and her father with a happy face comments: ‘now we can get a tea, I guess’. The message is simple, beauty and fairness equals higher status, happiness and success. This nicely portrays the “the intersection between racial ideology and capitalist consumer culture” (p. 40). The book itself points to many examples of prejudice and racism based on looks. An interesting one comes from Japan and the apparent racism against Koreans and Chinese prevalent in the popular Japanese comic books, such as manga. It is especially physical features that are being mocked in these comic books. (see for instance Asia Rivals’ Ugly Images Best Sellers in Japan or Racist Cartoons in Asia - An Example of Japanese Racism Against Koreans). “South Korea, incidentally, has had, as part of the new economy of Asia, the largest group of aesthetic surgeons practicing in Asia in the 1990s, primarily doing nose and eyelid alterations. (…) These westernizing surgeries, as undertaken by the middle-class Japanese, Vietnamese and Koreans, may be more about signs of achieving middle-class status than achieving and “American identity”, confirming once again that the desire to look a certain way is motivated by the pursuit of economic and social network power” (p. 41, emphasis mine). “The thin ideal is also maintained by social network mobility. Notably, thin women are more likely to marry in an upwardly mobile direction. Heavier women marry men of the same social class or lower” (p. 45). Another important topic is the surgeries people surrender to in the name of beauty and improvement. “There have been a growing social acceptance of plastic surgery and growing numbers of people engaging in it. The stigma is gone. Many of us are unhappy with our appearance and we greatly exaggerate to ourselves what we consider to be defects, with this dissatisfaction very likely culturally and socially generated. We compare ourselves to mass media images of beauty; indeed we want to look exactly like them, as it turns out. If full lips are in fashion, we can have them. High cheekbones? Tan skin? Blond hair? Blue eyes? Full lips? No problem” (p. 57). “If history is any judge, based on social reactions to other ‘isms’, lookism will remain a discriminating social attitude and behavior, even as it declines in social acceptability. There are signs that appearance bias is being at least discussed. There is greater social awareness. There are a few public policies leveled against lookism. And there are social movement organizations that are making small inroads into consciousness raising and legislation. It will take a long time. Most major social changes do” (p. 125). Among the books that encourage critical thinking about contemporary world, this one is of those you might like to read.